Ray was a very outgoing and friendly individual who was the heart of the Western Great Dane Club of B.C. for a number of years. He was always interested in encouraging new members, bringing out club members for events and willing to take the time to hold offices, including President. Our Club holds an Annual Specialty Show. Ray was very instrumental in organizing our Club, so we can do so. BISS Can & American Ch. dogs. Sandra was an excellent handler, winning Specialty Best of Breed, finishing American and Canadian Champions and she raised mulitple litters with me. 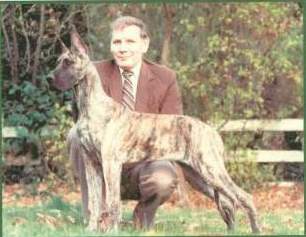 Sandra was a key member of the Western Great Dane Club of B.C., always working hard and filling various offices including President. Most importantly, Sandra was a warm hearted and good person. She was always willing to come over evenings and tape puppy's ears,or more than willing to handle a top Special. Her sudden death in August 2003 at such a young age was more than a big loss. She is sadly missed.